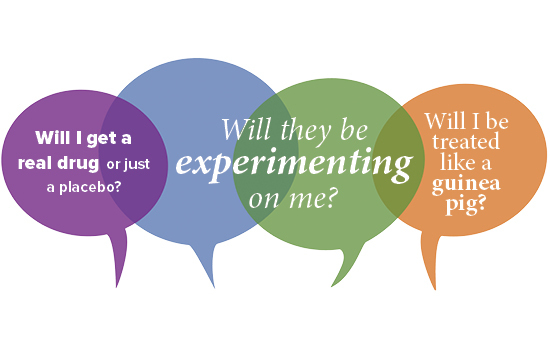 Cancer patients who consider going on a cancer clinical trial often start out with fears: will I be treated like a guinea pig? Will I get a real drug or just a placebo? Will they be experimenting on me? Sometimes these fears keep people from enrolling on clinical trials. Kate Yeager, Winship researcher and assistant professor in Emory's Nell Hodgson Woodruff School of Nursing, wondered if addressing those fears in a video could help breast cancer patients understand and be more receptive to clinical trials. A grant from the V Foundation enabled Yeager to produce two educational videos that explain key benefits and barriers in clinical trials, and feature breast cancer survivors who share their experiences and feelings about having participated in clinical trials. Because studies show low levels of participation in clinical trials by minorities, Yeager designed one video to feature concerns expressed by African-American patients. The second video is more general (see videos below). Over the past year, 50 breast cancer patients watched the videos and completed surveys asking if the information and patient stories were helpful. "My favorite part of the project was working with the women who had participated in clinical trials as part of their breast cancer treatment. They let us video them as they told their authentic, heartfelt experiences. I know their voices will speak to women who face some of the same decisions and provide them with useful information," says Yeager. The trial tested the feasibility of using educational videos in a busy breast cancer clinic and whether they can affect a patient's intention to enroll on a cancer clinical trial. Yeager says results will be released soon.